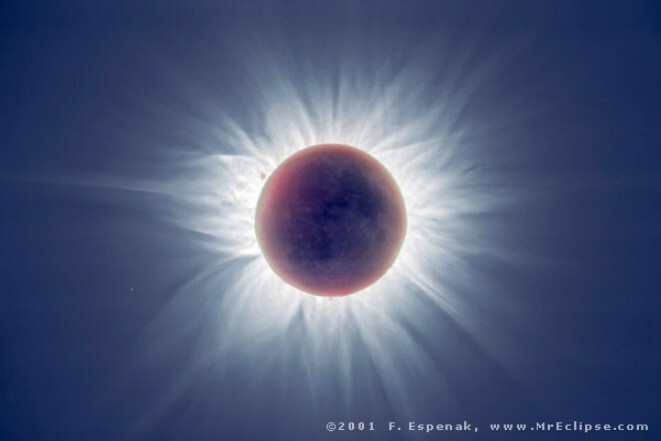 Explanation: This composite image was made from 22 separate pictures of the Moon and Sun all taken from Chisamba, Zambia during the total phase of the 2001 June 21 solar eclipse. The multiple exposures were digitally processed and combined to simultaneously show a wealth of detail which no single camera exposure or naked-eye observation could easily reveal. Most striking are the incredible flowing streamers of the Sun's outer atmosphere or solar corona, notoriously difficult to see except when the new Moon blocks the bright solar disk. Features on the darkened near side of the Moon can also be made out, illuminated by sunlight reflected from a full Earth. A giant solar prominence seems to hang just beyond the Moon's eastern (left) edge while about one diameter farther east of the eclipsed Sun is the relatively faint (4th magnitude) star 1 Geminorum. The still active Sun will be totally eclipsed by the Moon tomorrow, but the path of the total eclipse will mostly cross the relatively inaccessible continent of Antarctica.